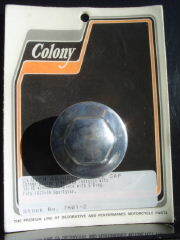 K-Model & Sportster Filler Cap Breather 1954-1976. Sportster Clutch Adjusting Hole Cap 1971-1976. Sportster Primary Filler Cap and Clutch Adjusting Hole Cap 1977-1984 (2 required per motor). Sportster Primary Filler Cap and Clutch Adjusting Hole Cap 1985-1990 (2 required per motor). Colony Stock #'s 7600-4, 7601-2, 7809-2 and 8776-2.